Barnsley’s unbeaten start to the League One season ended as Jordan Willis’ late goal secured a 1-0 victory for Coventry at the Ricoh Arena. Daniel Stendel was on the verge of recording the best league start by a Reds boss – eight games - until Willis headed home the winner 10 minutes from time. The Tykes again failed to take their chances and are still without a win at Coventry in 95 years, but they remain third in the table despite the late anguish. 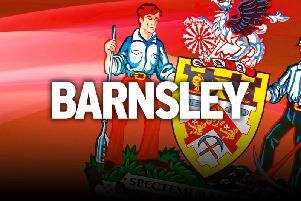 Barnsley signalled their intent early on as in-form striker Kieffer Moore, having fired a rare blank last weekend, headed wide. But it was Coventry - managed by former Tyke Mark Robins - who should have taken the lead in the seventh minute through Conor Chaplin, a player that Barnsley tried to sign this summer. The striker broke the offside trap to latch onto Luke Thomas’ pass but, when one-on-one with returning goalkeeper Adam Davies, he failed to find the bottom corner. Thomas had a shot deflected wide and Dujon Sterling, the only player retained from the midweek Checkatrade Trophy defeat to Arsenal Under-21s, tested Davies as Coventry threatened. Soon the Tykes hit back and Jacob Brown forced Lee Burge into a fine save, the goalkeeper tipping his effort against a post, before shooting wide. Brown was Barnsley’s main threat during the first half and, after Moore and Dimitri Cavare were wasteful, the winger tested Burge with a volley. Chaplin fluffed his lines at the start of the second period before Burge again came to the rescue for the hosts at the other end. Mamadou Thiam cut inside and curled an effort which Burge did well to tip behind for a corner. Chaplin thought he had finally broke the deadlock 10 minutes after the interval, picking out the bottom corner following a blocked shot, but the offside flag was up. Moore was continuing to cause problems without reaping the rewards, cutting inside and seeing a shot blocked by Dom Hyam. The striker had another go, stinging the palms of Burge following smart control from a long ball, while his former Rotherham team-mate Jonson Clarke-Harris could not test Davies. Davies failed to prevent Coventry breaking the deadlock in the 80th minute as Willis headed in after Junior Brown nodded on a Michael Doyle free-kick. As Barnsley pushed for an equaliser, City almost added a second but Chaplin was again off target.